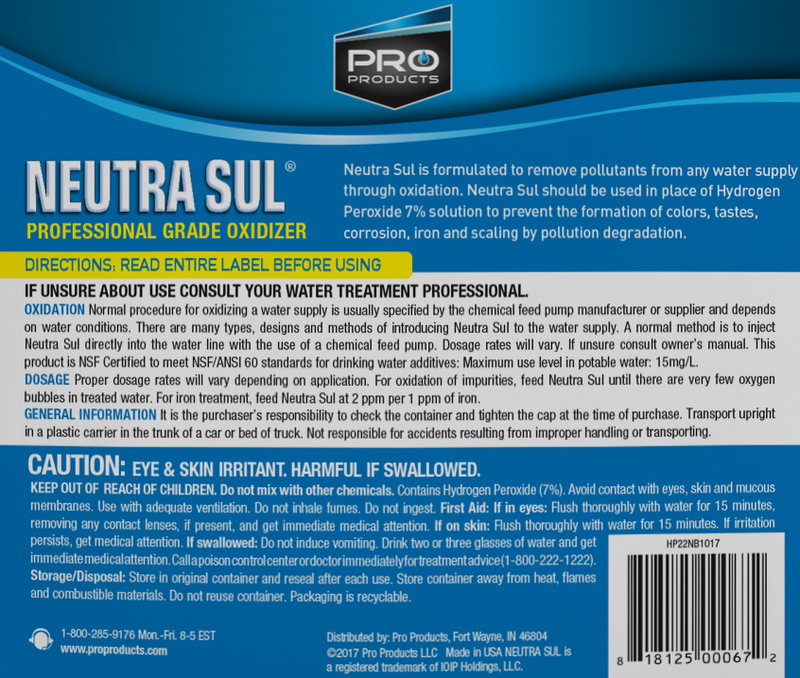 Pro Neutra Sul® is formulated to neutralize the rotten egg smell and pollutants from any water supply through oxidation. 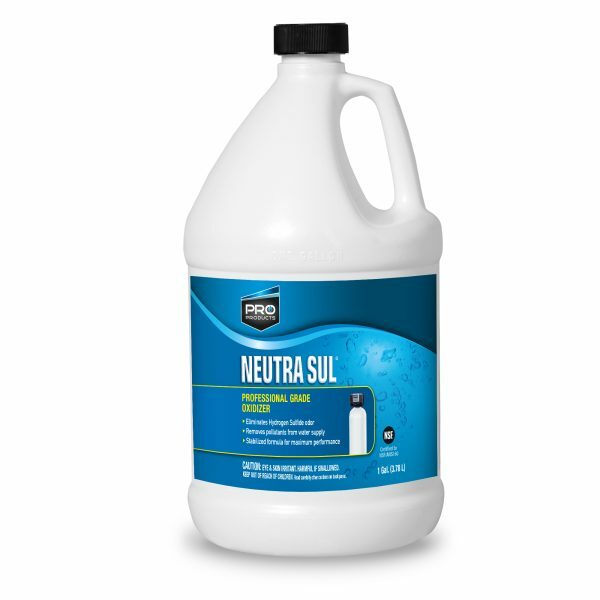 Neutra Sul has a proven consistency over hydrogen peroxide 7%, and can be used in place of Hydrogen Peroxide 7% solution to prevent the formation of colors, tastes, corrosion and scaling by pollution degradation. In fact, The stabilizer in Neutral Sul provides 5 times the shelf life of standard 7% peroxide, making it an even easier choice! Pro Neutra Sul is NSF Certified to meet NSF/ANSI Standard 60 for drinking water additives. Available in 1 gallon, 2.5 and 5 gallon sizes. Oxidation: Normal procedure for oxidizing a water supply and removing the rotten egg smell is usually specified by the chemical feed pump manufacturer or supplier and depends on water conditions. There are many types, designs and methods of introducing Neutra Sul to the water supply. A normal method is to inject Neutra Sul directly into the water line with the use of a chemical feed pump. Dosage rates will vary. If unsure consult owner’s manual. Dosage: Proper dosage rates will vary depending on application. For oxidation of impurities, feed Neutra Sul until there are very few oxygen bubbles in treated water. For oxidizing iron, feed Neutra Sul at 2ppm per 1ppm iron. The stabilizer in Neutral Sul results in 5 times the shelf life of standard 7% peroxide.